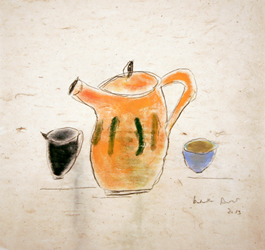 On show a selection of thirty works on paper from artist Isabella Ducrot. After the successful personal exhibit Bende sacre at Rome's National Gallery of Modern Art, which ended on May 18, 2014, Interno giorno ("Interior - Daytime") features a body of unreleased pieces, created from the year 2010 onwards. The silent witnesses of the day transform on paper to pure form, giving a glimpse of the game of battle, apparently having no structure because of the lack of perspective, but finding meaning in lines on the spatial horizon and in rules. The structure is in the dynamics of transformation, in the passage to representation; the structure is a means to itself, which is renewed in the choice of forms, proportions, and colors. The objects chosen by Isabella Ducrot do not completely transcend the daily, and belong to a scenic design of interiors; raised to the rank of protagonists, they pass from the present to a new present, and revel in their beauty, because they have been stolen from memory, like eternal children: there are no yearning and no fear in this representation which definitively distances itself from the wear of history." Born in Naples in 1931, Isabella Ducrot has been living and working in Rome for many years. In her extensive travels she developed a particular interest in fabrics from countries east of Europe and began studying the many differences in the textile traditions of China, India, Turkey and Central Asia. Over the years she has amassed a collection of rare fabrics of historical interest, and has long used textiles in her own work. In 1989, she created 12 paintings made up of panels that incorporated fragments of an Andean fabric dating back one thousand years. She subsequently spent two years creating a rich series of tapestries around a recurring motif in Ottoman culture, the cintamani pattern. She presented a large tapestry at the 1993 Venice Biennale that is today part of the collection of the Contemporary Art Museum of Gibellina, Sicily. In the 1990s she also began using paper, to create a series of large drawings and monotypes in black and white. In 2002 she created a series of paper tapestries entitled "Memorie di una terra", from memories of a trip to Afghanistan, which were exhibited at the Milan State Archives. A large collage (4x4m) of fabric, paper and paint was exhibited and acquired by the Galleria d'Arte Moderna in Rome, while a large pastel on silk is part of the collection of Rome's National Gallery of Modern Art (GNAM). In 2005 she created two mosaics for the Piazza Vanvitelli metro station in Naples. In 2008, she had an individual exhibit at GNAM entitled "Variazioni" and published Text on Textile (first in English, then later in a slightly different form in Italian as La matassa primordiale). In 2011, she was invited to exhibit her work at Venice Biennale, Italian Pavilion. In 2014, GNAM featured another individual exhibition of hers: "Bende sacre". Isabella Ducrot has shown her work in Rome, Milan, Paris, Berlin and New York. She has created backdrops for the theatre, concerts and the ballet (Rome Philharmonic, Lecce Balletto del Sud). Critical essays on her work have been published by Ritanna Armeni, Ginevra Bompiani, Giovanna Bonasegale, Achille Bonito Oliva, Patrizia Cavalli, Marcella Cossu, Federica Di Castro, Laura Cherubini, Erri De Luca, John Eskenazi, Ruggero Guarini, Diane Kelder, Raffaele La Capria, Bruno Mantura, Maria Vittoria Marini Clarelli, Sandra Pinto, Massimiliano Alessandro Polichetti, Silvia Ronchey, Lucetta Scaraffia, Nadia Tazi, Luciano Trina, Tommaso Trini and Stefano Velotti. An interview with Isabella Ducrot on RaiSat (in italian).